The camera used to have a 35-70mm lens on it (I’ve since replaced it with a 50mm) and evidently I used to keep it at the 35mm setting and take lots of pictures with too much sky and tiny people in the middle of the frame. So I was trying to remind myself to move closer and fill the frame more. Two decades on, it’s amusing to see this message I wrote to myself, a critique of my photography at the time. So much has changed — I now have digital cameras and prime lenses, for one thing. But some things have not. I still love photography and still want to get better. So I’ve been wondering: if I was going to update this piece of card with some new advice, some different photography tips, what would they be? I decided to ask some other photographers to tell me the best advice they had ever received or would like to. Here are their answers. Learn how to market and promote yourself. There are millions of people trying to be photographers today, which means the odds of making it are similar to that of an actor in Hollywood. Getting discovered is the key and thinking your work will just speak for itself just doesn’t cut it anymore. Adopt a multi platform approach, publish work to Instagram, Tumblr, 500px etc. Keep your style and subject matter consistent. Be ruthless when it comes to the edit. You will always be judged by your worst photograph. Once you get discovered, and if your work is good enough, the commissions (payment) will follow. The best advice I was ever given about photography was to unplug. To stop looking at what everyone else was doing and focus on what I wanted to do. Stop looking at blogs of people in your same field. It will do you wonders in allowing you to expand your own personal voice/vision. Compose the picture until it is perfect, then move the camera back a yard! Two things: my grandfather taught me to take notes on each frame (film, ISO speed, aperture, shutter). You learn a lot from that as to how a film performs in different light. Second, “learn to see light”. That’s really all it’s about from inspiration to effectiveness. Keep shooting! Can’t remember who said that — probably everyone — but it’s crucial. Also, I never forget my Dad commenting on an image I took of a family friend with what was probably my first camera when I was 10 years old or so. She was sitting across the table from me but with her head turned to my right. I placed her in the last third of the frame so that she was looking towards the right edge of the image with lots of empty air behind her head to the left. My Dad said that it would have been much more interesting if the viewer could see more of what she was looking at and not just the room behind her. Even though I very rarely shoot people, I think about this from time to time; I guess we can call it a lesson in deliberate composition? I was told that most of the time, we have to take a lot of photos to have one or two that we really love or that are really strong. Some famous photographer from decades past (not sure who) was supposed to have said that in one full roll of 24 frames, she/he would be happy to have one or two images they really liked and believed were strong. So, look at as wide a range of other photography as possible, step back, take notes, learn to see light, keep shooting! I realised that I have been trying to condense my entire approach to photography onto a tiny piece of card. Having thought it over, I decided that I could distill it all into one word: “focus”. This works on many levels: it refers to the process of focusing, obviously, but also on the need to be mindful of the situation. More broadly it alludes to the idea of deciding what I want from an image before I even look through the viewfinder and, beyond that, my commitment to work at my photography so that I get better at it. So, “focus” it is! What’s your favourite piece of photographic advice? Will it fit on a tiny piece of card on the back of a camera? Let me know in the comments! What a treasure that camera is – such a lovely message from the past. And this post is such a great reminder to keep striving to improve! I love that about photography. There is always something to try to and improve. That is such good advice. I shall definitely give that one a go. Thank you. I adored this! From your handwriting on that treasured camera to all of the wonderful advice. i love the note to yourself in your dear father’s camera–so precious and so telling in that you would definitely be a photographer even at that young age by advising yourself on how to improve! such a wide variety of suggestions from Jonathan’s “stop looking at what everyone else was doing” to Meghan’s “look at as wide a range of other photography as possible!” i love it–something for everyone!!! i think Cara is spot on to document each photograph–i often wonder what it was i did before in something i really like! and Jenny’s “keep shooting” speaks to me because i get in my own way and worry too much when i should just be shooting because that is truly the only way to improve–and it brings me great joy!!! i am far too insecure to market myself but will surely keep Finn’s suggestion in the back of my mind and i will try David’s approach!!! I love that you have his camera. Nothing could be more special. I’m so struck by how many of our generation entered photography through their fathers. A unique gift. For me, that waiting is what resonates. The decisive moment. I always smile when my husband calls me and tells me “take a picture of this!” Because the images I love most, are typically ones I was framed up and waiting for, not the ones I jumped on. Well, not so much posed and set up — but anticipating, being there and ready and then waiting. I guess I do better when I say, plan to photograph our walk and then be ready, rather than jumping into a moment that is already ongoing. If that makes sense. 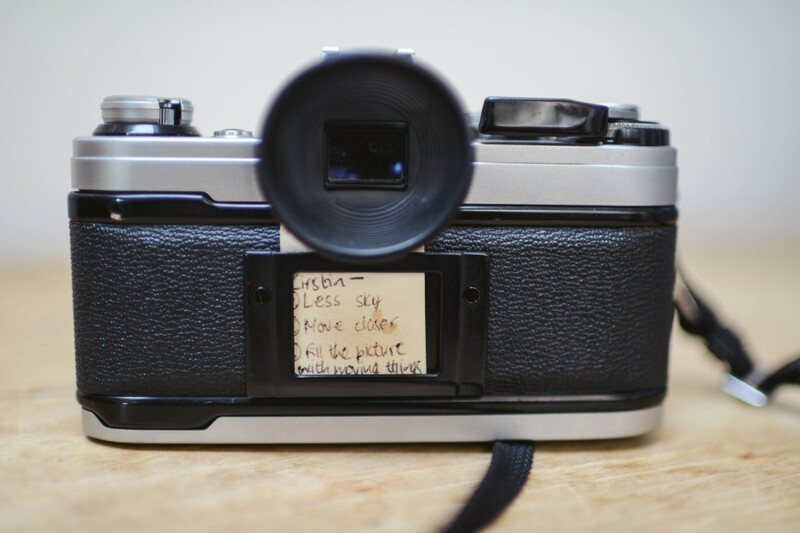 It is so special that you still have that camera from your dad–and the note to yourself is just perfect! Great post, wonderful advice. The note to yourself is the best and thanks for sharing these collected words of wisdom! You know me and notes. It’s the trying to remember what is on them that I need to do next! I love that little snippet from your past. Some wonderful advice here! thank you for this. such an important post. Thank you for your advice, Cara! I love that you wrote yourself a note and that you still have it. Great post and advice.